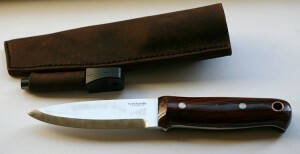 A while ago one bushcraft knife was ordered from me, a woodlore clone. So I was told. This was the first time I heard about these knives and of course I accepted the challenge. This type of knives use flat grind blades and I’ve never made one before, except when doing the katanas. But it was still a first time on a knife. I used CPM S30V steel for the blade and desert ironwood handles. Sheath was from natural leather with place for firesteel. I did have to make 2 of these knives, as on the first one the grind didn’t work out as well as needed – that will stay for personal use. Overall the knife came out OK. But like always, there’s a lot of room for improvement.